Metsa is considered one of the forerunners of Corporate Global Sustainability and the environment is of key importance to your firm. Is the Green and Peaceful Environment surrounding Opera Office important and for you and your employees? One of the most important values of our company is the concern for the environment. At every level in our organization we try to show that value and implement it. The green surrounding around the Opera Office is thus very important to us especially as it also improves working conditions of our employees making them more relaxed and efficient. Using a bicycle to commute to work is becoming more and more popular. 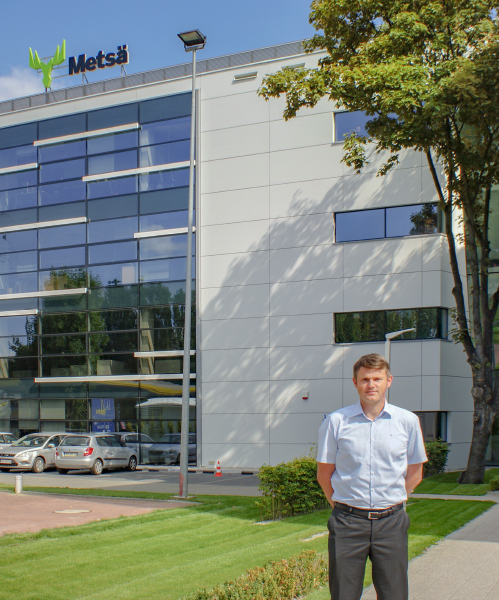 Are Metsa`s employees using bicycles and how does the Opera Office facilities satisfy their needs? We encourage our employees to be active. We participate in the European Cycling Challenge each year and organize an internal cycling competition in our company. It runs from May to September and each of our employees can participate in it. Cycling is very popular among employees. The bicycle infrastructure in the Opera Office is modern, comfortable to use and safe for people and equipment. Public transport accessibility is becoming crucial from an HR point of view. Can you describe how accessibility and safe the public transport is to Opera Office? Opera Office is located in Wrzeszcz, one of the main districts of Gdańsk. This place is very well communicated. We have access to public transport so that we can travel in all parts of Gdansk without problems. Our employees who live in other parts of the Tri-City can come to work in a convenient, fast and cheap way. How important is easy access to Opera Office in busy periods? Opera Office also has one of the most generous parking space ratios per per square metre of any office building in Tri-City. Is this an important factor for you and your staff? The use of parking spaces in the garage is a great convenience for big part of our employees. We are glad that we have the opportunity to have a large number of parking spaces and that in the near future their number will increase. Many of our employees are parents. The ability to come to work by car, and above all, leaving it close to the office makes it easy to reconcile their duties daily.